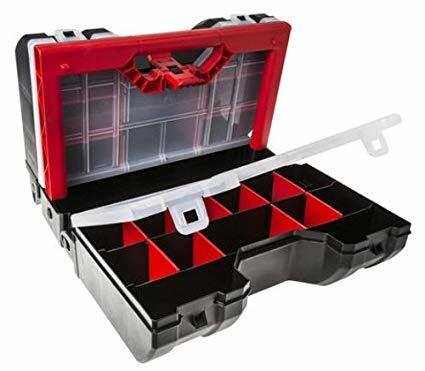 Could anyone give me some ideas for a small, or at least easily portable, toolbox that has lots of compartments to keep everything organized? So far, I’ve only found a Facom 21-compartment organizer. But what else is there? If your not dead set on a box style, I would suggest you take a look at the Veto Pro Pac bags and backpacks. I picked up one after having to do field work and I still carry it around 3 years later as it has more than enough organization and space for all my tools. To warn you… they are rather expensive, but worth every cent in the end to me. The Keter cantilever organizers are nice. I own a few and they are similar to a tacklebox, albeit more sturdy and user-friendly (IMO). What are you looking to store? Small parts like nuts and bolts or tools, or a mix of both? if you want best boxes then tackle boxes are best and they also available in different styles.